A safety clasp on the back of a pin is the one you are probably most familiar with as it is commonly used today. It is sometimes called a locking pin finding. Safety clasp or locking pin finding. On the left securely locked. On the right, the open position. Hand made safety clasps appeared on non-Native American jewelry since the 1900s. 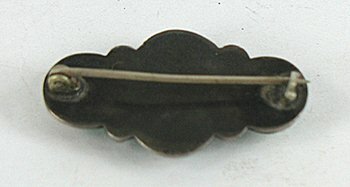 The modern safety clasp began being manufactured in the 1930s. But it wasn’t until about the mid 1940’s that safety clasps became readily available to Native American silversmiths and started to show up on pins and pin-pendants. Prior to that time, the simple C clasp was used, which was a curled piece of silver on which to hook the pin – simple. If well made, it would be very secure; if not well made, the pin could bend or otherwise come unfastened. Is it possible to get another thunderbird like the vintage P133? the new thunderbirds do not look like this one. Thank you very much. Thanks for writing. The items in our pawn shop are older items and we get them in, usually in a lot such as from somebody’s collection or an estate lot, so there would be no way of predicting when we might get something similar to that Thunderbird pendant in. It looks a little more Pacific Northwest to me rather than Southwest. You could keep an eye on our NEW page which is where we list something new each day – and that means pawn items as well as new contemporary. I’ve just listed a few new Thunderbirds which I think you might like………. These wonderful old style pins are made from heavy gauge sterling silver plate; hand cut, deeply hand-stamped, smoothed and polished leaving some areas intentionally oxidized or darkened. 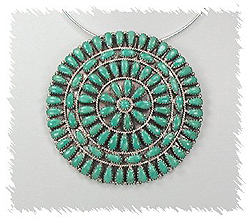 A polished turquoise stone is set in a handcut smooth bezel. A twisted sterling silver rope encircles the bezel. Albert Cleveland typically uses King Manassas turquoise, known for its brilliant greens with gold or brown matrix. They have a locking pin finding. Very retro. Albert Cleveland is of the Dashchanii clan and was born on the Navajo reservation near Mt. Taylor. He and his wife live near Gallup, New Mexico. His brother is Bobby Cleveland and his parents Etta and Philip Cleveland. Cleveland signs his pieces AC if he works on them alone or AJC when his wife Jacqualine works with him. Albert Cleveland works in a retro style, reminiscent of the 1940’s curio shop work which featured Native American symbols such as Eagles, Thunderbirds, Bears, Waterbirds and other animals. The Native American pin is a traditional piece of jewelry worn with great pride on a broadcloth or heavy velvet shirt. The cluster pins are probably one of the oldest Native American stone pin styles. Customary places to wear a pin include: on the lapel of a jacket or blazer, on a larger shirt collar, at the neck over the top of the top button or on a turtleneck, on the front of a shirt on one side or the other above the breast, on a sash, and in conjunction with a scarf at the neck. But there are many other ways to use pins. To make pins more versatile, many Native American artists add a loop or Shepherd’s Hook on the back so the pin can double as a pendant. The beauty of a Shepherd’s Hook is that it can be opened up to fit over large beads while a loop has a fixed size. But even if a pin does not have a pendant loop or hook, if the pin in mounted vertically on the back of the pin so the pin would hang upright, you may be able to loop a chain or collar through the pin or fasten the pin to a sterling silver bead or stone necklace. Beyond that, the larger pins make wonderful winter coat pins and they can be used to fasten a winter scarf in place or as an embellishment any where along the scarf including at the very bottom of the scarf kind of as an small anchor weight ! Many designer purses have fobs and dangles as their signature so why not fasten a pin on a strip of leather or cloth to make your own personal statement. If your bag is fabric, you could attach a pin right onto the front of your purse. If you are a hat wearer, a pin can change the look of a hat in an instant. This works just as nicely on a felt fedora or western hat as it does on you winter knit cap. What other great ideas do you have for wearing pins? When you need a special gift for you Mother, Grandmother, wife or girlfriend, think of a Grandmother Pin. The Grandmother Pin (also known as a Mother Pin or a Cluster Pin) is a stone cluster pin (or pin-pendant) made by a Navajo or Zuni artist. It is meant to symbolize the matriarch of the family at the center with the family members and their families radiating outward. Traditionally a cluster pin is made of turquoise, but occasionally we will see an all coral or other stone cluster pin.